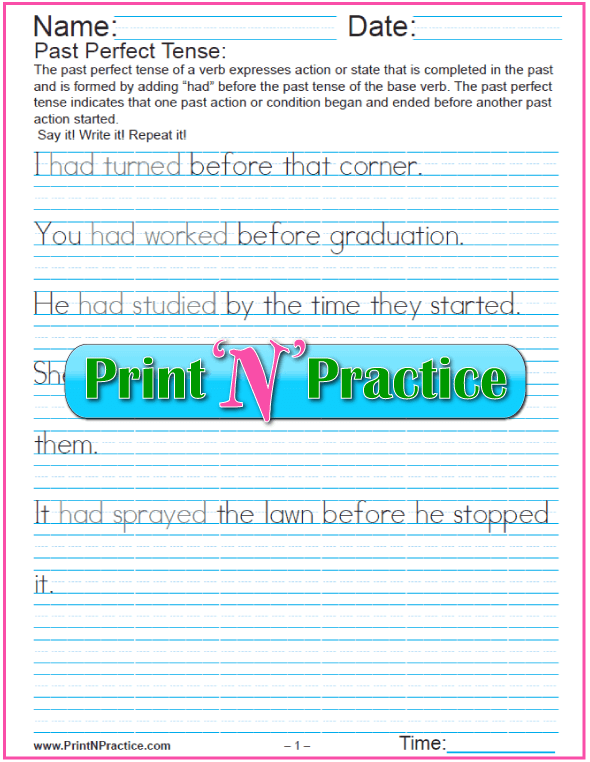 Verb Tenses Worksheets: Present Continuous Tense. Manuscript and Cursive. See below. Print any of these verb tenses worksheets for the tense you are teaching. 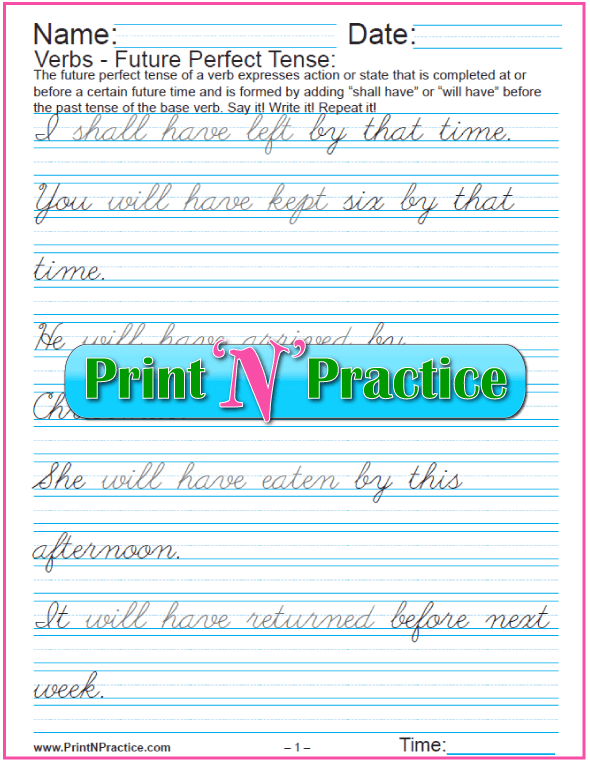 These give the children practice with the tenses in English Grammar and they are available in either manuscript or cursive writing. I find that the tenses are easier to teach if I present them in order of time. I like briefly previewing all the verb tenses in my first and early explanations of tenses so that the children see how the tenses are related in order of time. No matter what an English Grammar book says, the past came first and kids understand tenses better once they understand how past, present, and future sit on a timeline. They also retain a better sense of the tenses this way so I use a timeline when I am teaching tenses. NOTE: I find that the past verb tense is easier to teach to little ones while using a timeline. I put a super simple timeline at the top of the whiteboard and simply put Past, Present, and Future over a number line. I don't write much. The timeline is not the star of the show. It's there to set my columns for the past, present, and future on the board. So many text books teach the time tenses showing the present first. 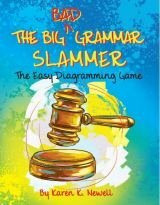 I say, "No wonder the children have a hard time remembering the tenses in English Grammar in their natural order." From now on this is the main way that I will teach the Grammar tenses - in order. I've added a printable chart for learning proper grammar with a timeline that shows the past, present, and future tenses in order under a timeline. Also, I've condensed all our verb tenses worksheets here into one easy place to find and I've rearranged the order to be in order of time as with past coming first. 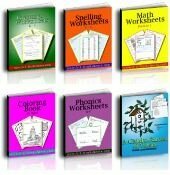 Some of these worksheets have as many as two to eight worksheets to choose or to print for several assignments or daily practice. 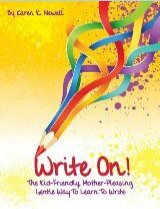 Each is available in both manuscript and cursive writing copy work. What is a verb tense? It's simply the time sense of a verb and how it fits into the past, present, and future. Remember what a verb is: A verb is a word that expresses action, state, or being in a sentence. Verb Conjugations – The verb conjugation is the correct expression in regular order of a verb’s modes, tenses, voices, persons, and numbers. Tenses are just one facet of the meanings that verbs can give. Simple Past Tense Verbs – The simple past tense form of a verb expresses action or state in the past (the action already happened) and is formed by base verb. Fan, fanned. Simply add the suffix -ed for regular verbs. Regular verbs - Those verbs that use -ed for the past tense. These are the regular past tense verbs. There are eight pages of past verb tenses worksheets in these downloads. Past Perfect Tense Verbs – The past perfect of a verb expresses action or state that is completed in the past and is formed by adding “had” before the past tense of the base verb. I had left before the storm. 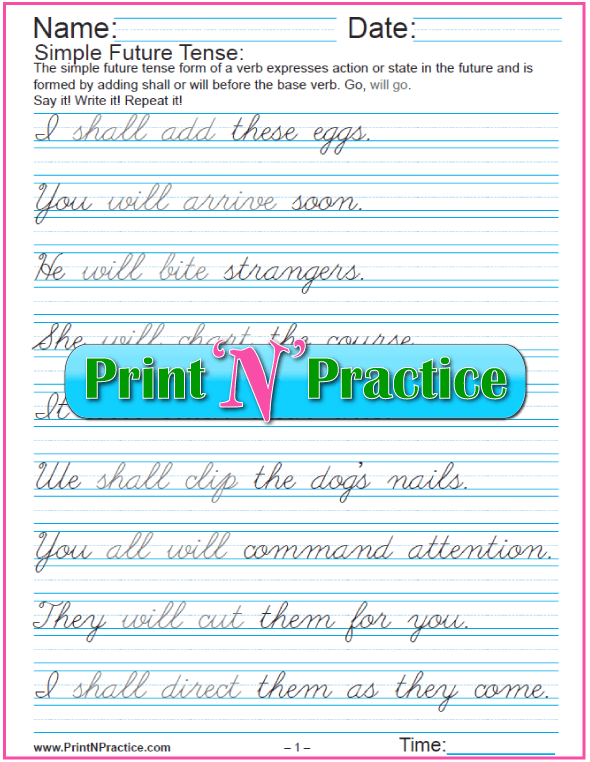 Two PDF verb tenses worksheets to download. Helping Verbs (Auxiliary Verbs - “Auxiliary” almost means “helping”.) – A Helping Verb (auxiliary verbs) is an action, state, or being words that are used together with other verbs to express changes of thought such as voice, mood, tense, person, number, and other shades of meaning or its conjugations. A helping verb is used with another verb to form its conjugations. Do, be, have, shall, should, will, would, may, might, can, must, ought are helping verbs. 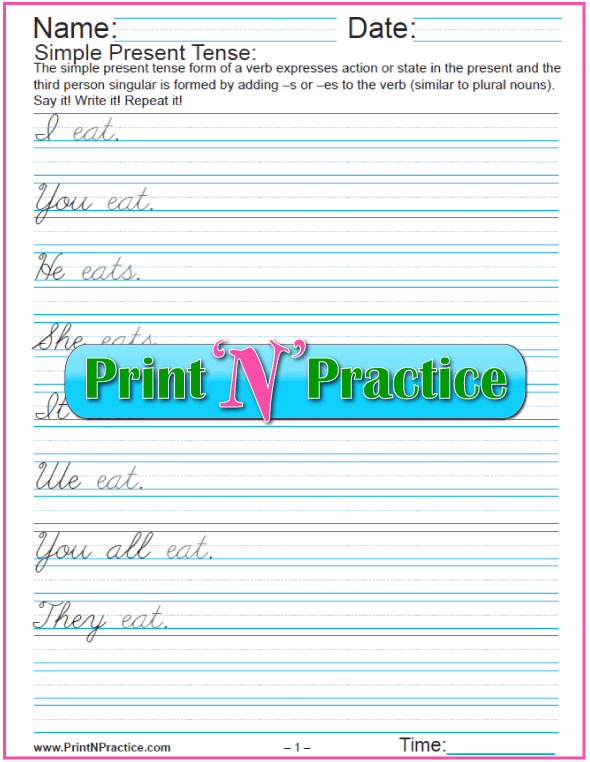 Find more worksheets for these verbs on our page for different Types of Verbs Worksheets. Simple Present Tense Verbs – The simple present tense form of a verb expresses action or state in the present and the third person singular is formed by adding –s or –es to the base verb (similar to plural nouns). Run, runs. 2 Worksheets per download here. Present Perfect Tense Verbs – The present perfect of a verb expresses action or state that is completed today and is formed by adding “have” or “has” before the past tense of the base verb. I have run. Choose present perfect verb tenses worksheets from these 2 page PDFs. Present Continuous Tense (Present Progressive Tense) – The present continuous tense of a verb expresses action or state that is happening, continuing, in the present, now and is formed with some form of the verb be and adding the suffix –ing to the regular verb. You are learning grammar now. 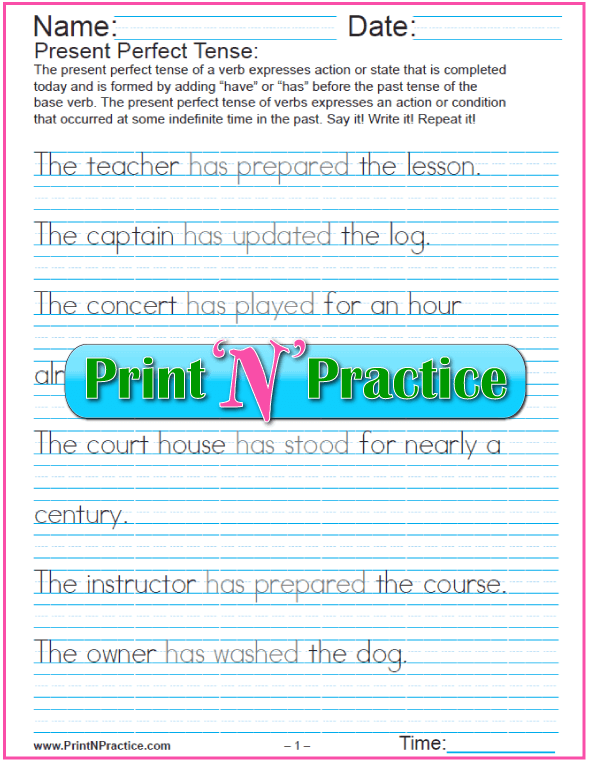 There are four present continuous verb tense worksheets with each of these downloads. There's an excellent description of the present perfect continuous tense at English Page. It not only describes how to form the positive, negative and interrogative of this verb tense, it shows how to form the active and passive and how to place adverbs. 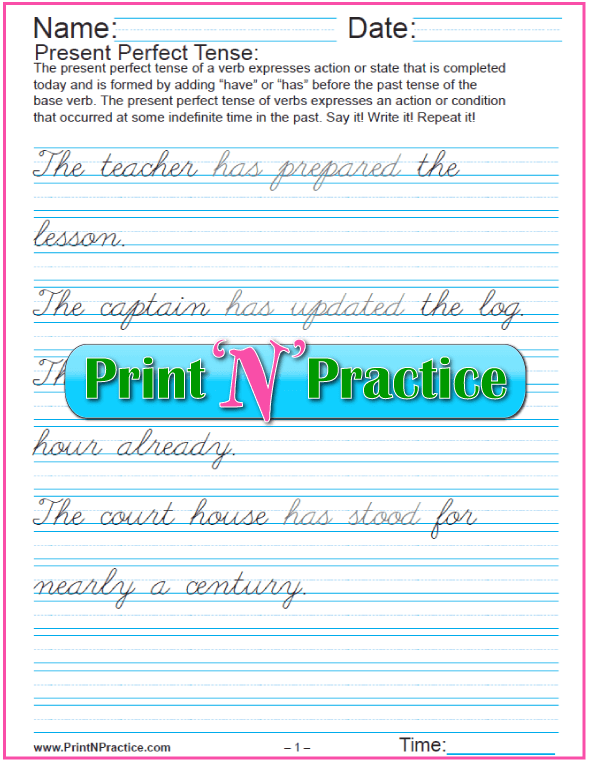 EnglishPage also has online present perfect continuous exercises. Simple Future Tense Verbs – The simple future form of a verb expresses action or state in the future and is formed by adding shall or will before the base verb. Go, will go. 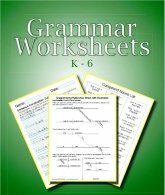 Each of these downloads has five simple future tense English worksheets to make the tenses in English Grammar easy for your students. Future Perfect Tense Verbs – The future perfect of a verb expresses action or state that is completed at or before a certain future time and is formed by adding “shall have” or “will have” before the past tense of the base verb. I shall have left by that time. Verb Tenses – Tense is the verb conjugation that shows time. A Verb Tense is the different form a verb takes to show the time of an action or state. 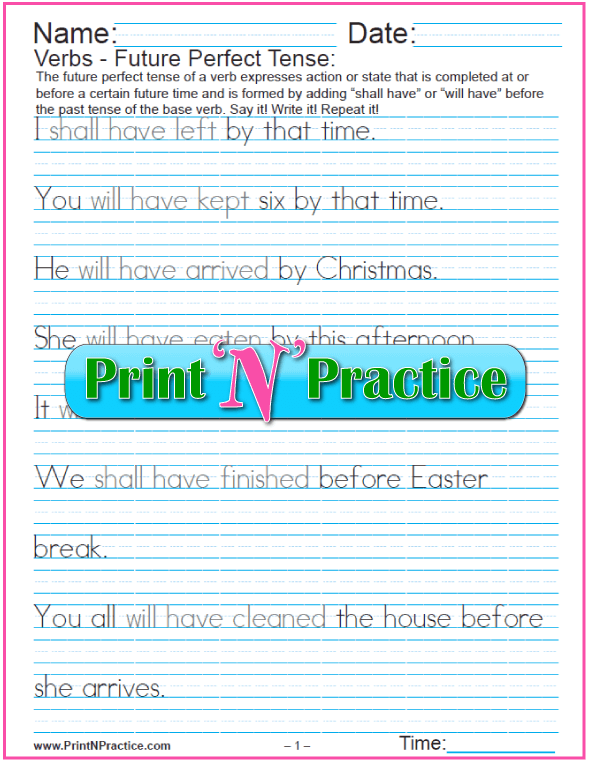 See our verb tenses worksheets above. Simple Past Tense Verbs – Regular verbs + ed. Irregular Verbs List do not add –ed; refer to dictionary. Past Continuous Tense (Imperfect Tense, Past Progressive Tense) – was or were + base verb + -ing. 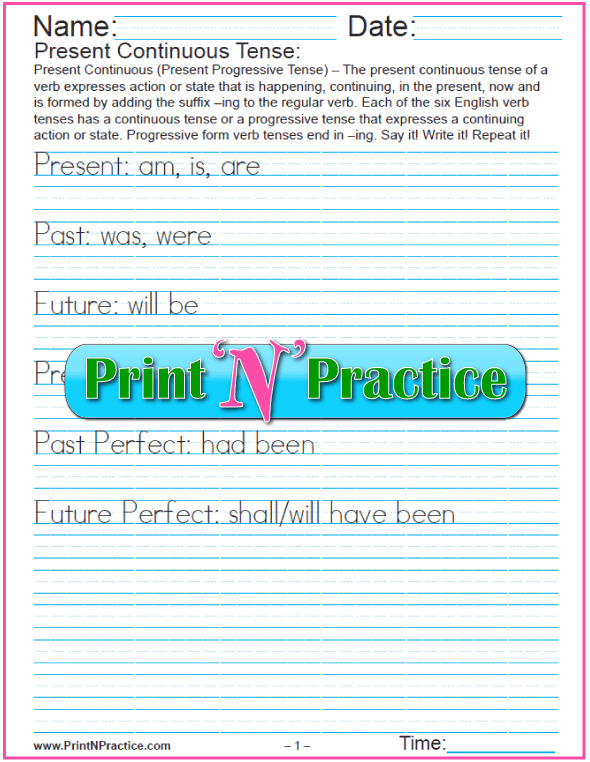 Past Perfect Tense Verbs – had + past tense verb form. Pluperfect Progressive (Past Perfect Progressive, Past Perfect Continuous) – had been + verb + -ing. Simple Present Tense Verbs – Base form of a verb without "to". Third person singular adds –s or –es. Present Continuous Verbs - Present progressive – am, are, or is, + base verb + -ing. Present Perfect Tense Verbs – have or has + past tense verb form. Simple Future Tense Verbs – shall or will + the base verb form. Future Progressive Verbs – will be – base verb + -ing. 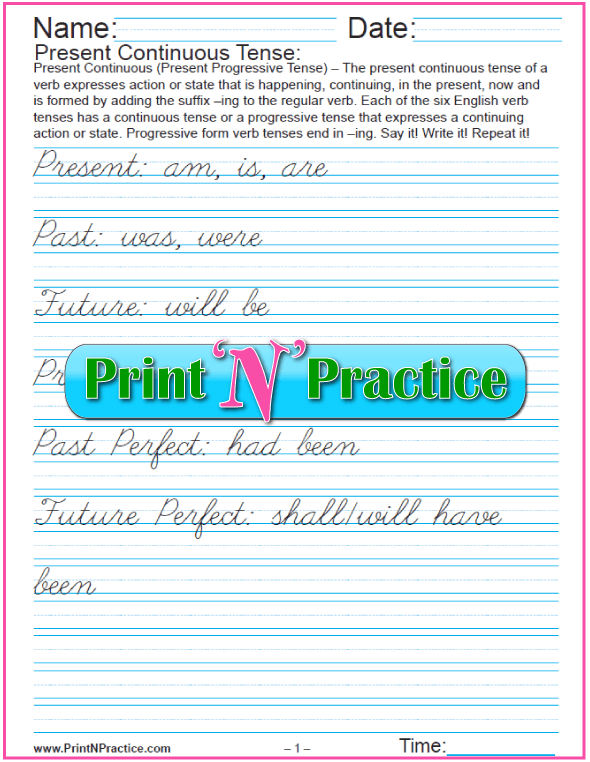 Future Perfect Tense Verbs – shall have or will have + past tense verb form. Future Perfect Progressive Verbs – will have been + base verb + -ing. Present Subjunctive Tense – Base form of the verb or be. Third person singular does not add –s or –es. Imperfect Subjunctive Tense – Past Subjunctive Tense – past tense of the base verb or were. Ola's online English Grammar exercises give immediate feedback and even have hints! She uses stories to help you understand the English tenses. Super idea! She also has free books like "first readers" that demonstrate the English tenses. Check out Ola's site at Really-Learn-English.com to learn the verb tenses. Thank you for visiting our verb tenses worksheets. We hope your students have a much easier time with the tenses in English grammar.